With Summer comes the opportunity for a wardrobe re-vamp. The weather is brighter and (hopefully!) warmer, so the layers can be cast aside and we can slip into something a little more floaty, floral and colourful! With Summer holidays a not-too-distant dream into the future, I like to get some things that I know that I will take away on holiday with me ready in preparation and also because it's exciting to start getting your holiday essentials prepped don't you think? With that in mind, I'm going to show you a few things that I think are perfect for the beach or the approaching festival season. I will start getting some more new pieces over the next month or two so that I have plenty to choose from, but here are a few staples that I already love and that will be making an appearance at a beach or festival very soon! My favourite bikini from Summer 17. The neon peach triangle bikini from H&M. This was certainly my go-to and absolute winner for last year when I went on holiday to Cyprus. It walked the line between being pastel and simultaneously neon which I like and also the shape was perfect for me. Style wise I love it still and it will most certainly get packed again for this summer's vay-cays! Alas, this season re-welcomes the pastel revolution. Since pastels became a popular summer trend a few years ago, they've never left the market and this year it's all about mix 'n' matching those dreamy tones together like a triple scoop ice-cream cone. For me the perfect way of introducing pastels starts with nail colour. It's fun and the shades all really compliment one another, so they can be interchanged and worn together or separately if you prefer. My all time favourite dreamy pastel colours come from Barry M's nail polish range, as they have an extensive selection and some are in 'gelly' formula too for a really professional finish. The shades Peach Melba, Sugar Apple and Strawberry Ice Cream are my three personal favourites. This summer I'm also going to add a pop of pastel to my clothes and particularly I would like a pastel blue off the shoulder top in a light-weight, 'floaty' fabric that will be perfect for a Mediterranean holiday. If you're heading out to any festivals this summer or you've been to some before, then you will know that getting adorned in body paint and of course face gems and glitter is obligatory. I have some festival face gems from The Gypsy Shrine who specialise in a beautiful array of bedazzling glitters and gems which are perfect for festivals or parties this summer. I think as soon as you add some sparkle to your make-up look, you instantly feel more glam and party ready for sure. 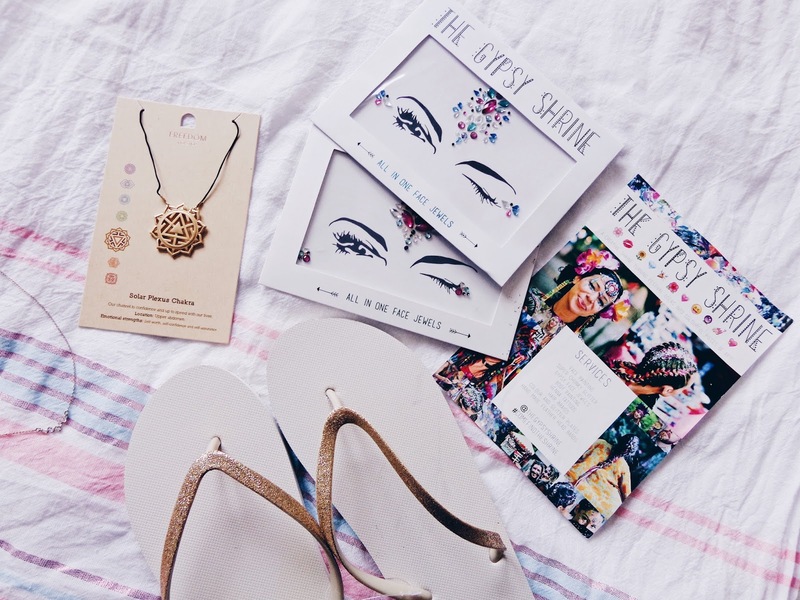 I've included some gold glitter flip flops from Accessorize and a gold solar plexus chakra necklace from Topshop as some of my other festival essentials as they just exude 'festival' with a slightly bohemian vibe. Also, for festivals it is really important to make sure that you keep all of your valuables including your phone and money together and on you at all times so that it doesn't get lost or stolen. The Marmite of the bag world they may be, but bumbags are a truly ingenious idea for festival season or actually any day when you don't fancy feeling restricted by slinging a bag over your shoulder or having to actually carry your phone and purse around with you in your hand. Paired simply with white denim shorts and a statement t-shirt or a crop top, they can really draw an outfit together and River Island's current season selection is on point! A summer must, as nobody wants to be wearing loads of make-up mid-summer really. 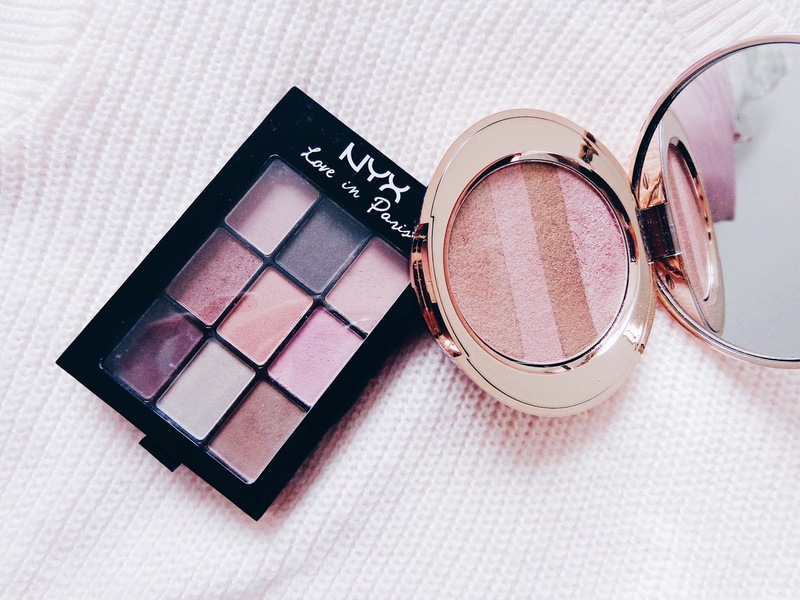 I love the No 7 rose gold bronze and pink highlighter compact with four subtle yet high-shine tones in it as well as the NYX 'Love in Paris' eye shadow set. All of the colours are neutrals or light pinks so work well together and there are also lots of different colours which can be used as the transition colour, so you can create a whole multitude of different looks using the one pallet which is ideal for taking on holiday! This post contains sponsored content from River Island. All views and opinions remain honest and my own.